Tentori brings a splashy sense of playfulness to KL's izakaya-style experience, in a contemporary setting that catches both the eye & imagination with its colour & energy. 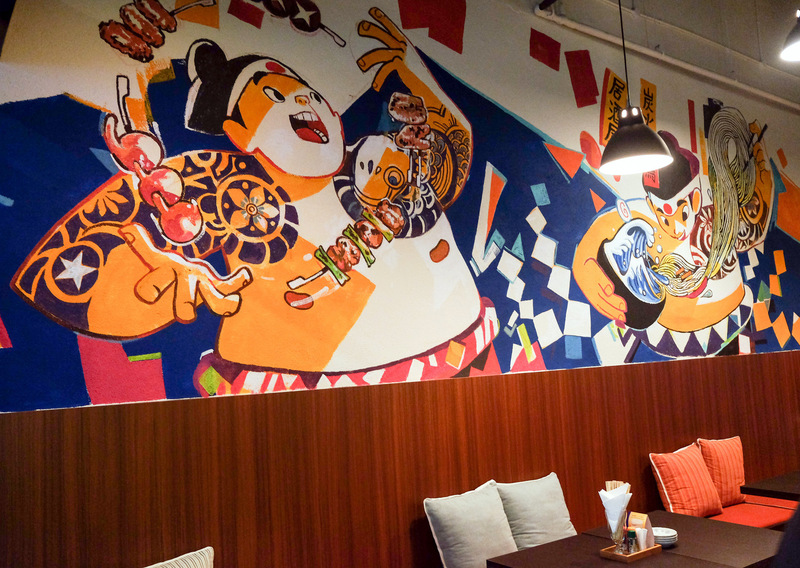 Check out the sumo-fancying murals & the sake-flooded shelves that line the walls. Pork plays a pivotal part in the menu - the Suntory beer-battered pork & chips are an interesting take on British pub grub, with the fish replaced by tender slices of pork in a flavoursome batter; it's best for sharing, since the substantial portion will sink everyone except extreme gluttons. We might skip the buta kakuni next time though - when we visited a few months back, the braised pork belly was afflicted by an malodorous flavour. But the kushiyaki selection proved satisfactory, from succulent pork skewers to crispy chicken skin & savoury chicken with cheese, plus lamb rack with shogayaki sauce, sweet potatoes & corn. Tentori IzakayaGround Floor, Nexus Bangsar South, Kuala Lumpur.